Here at Wilson Laidler & Co. Ltd, we can help you with the high access requirements of your project in Sheffield by using our cherry pickers. Working at height is something that can be challenging, but also very necessary, in a construction environment so we have experienced and licensed operators to help ensure you are in safe hands. If you would like to enquire further about our high access services, please contact us by calling 0114 248 1158 or filling out our online form. We work with modern equipment to ensure the most effective and efficient access at all times for your project. Our cherry pickers are able to reach heights of up to 18.8m, which makes them perfect for most commercial and domestic projects in Sheffield. 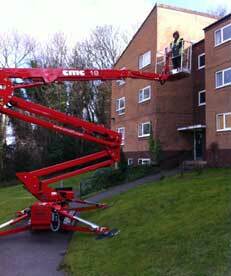 As aforementioned, we also have highly trained and experienced boom lift operators to ensure our high access services are carried out responsibly and in the most effective manner. 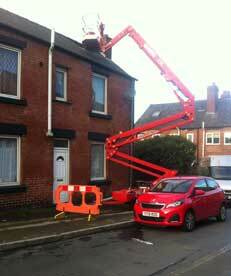 Our high access services are effective and efficient to ensure that the project is carried out safely and swiftly. It’s important, when working at height, to do things the right way and experience is an essential aspect of this. We have over a decade of experience in providing our customers with high access services, which means you can rest assured that the work we do for you adheres to the strict working at height regulations at all times. If you would like to hear more about what high access services Wilson Laidler & Co. Ltd can provide for you in Sheffield, please reach out to us by calling 0114 248 1158 or filling out our simple contact form.